Harmony in living course will guide you through an exploration of ancient traditions, deepening your appreciation of being alive. Slow down. Pay attention. Live each moment fully. Becoming conscious of your type, lifestyle patterns and ‘ways of being’ can bring better health and happiness. These exploratory workshops will energise you with ideas, providing a greater understanding of what creates health and balance. Discover your own practice of harmony in living. The course consists of 4 x 120 minutes exploratory workshops led by Dr Eleni, a medical Consultant and Ayurveda practitioner. The workshops combine the power of wisdom traditions, current medical practice and Ayurveda with other scientifically proven practices, such as meditation, to help you lay the foundations of good health. Guided meditation, knowledge exchange, sharing of personal experiences, food and drink recipes, music and art brought to you by Dr Eleni. Dr Eleni Tsiompanou is an experienced Medical Consultant who has worked in the NHS since 1997. She is a Fellow of the Royal College of Physicians of London (FRCP) who has also trained in Ayurveda and nutritional medicine. Eleni’s personal quest, knowledge and ongoing research has uncovered gems of practical information which can help people find their own balance, better health and harmony. As an Ambassador for the ‘College of Medicine’ in the Harmony project, Eleni is inspired by HRH, The Prince of Wales’s book Harmony: A New Way of Looking at Our World, which reminds us of some profoundly important truths, namely that everything in the universe is connected and balanced by universal laws and relationships. Description: Ayurveda, which means the Science of Life in Sanskrit, is a 5,000 year old practical and holistic approach to health. It regards everyone as a unique individual. Its main principle is in helping us find a balance between our mind, body and spirit. It looks at our individual type, energy, diet, personality as well as our relationships and environment, to offer guidance in maintaining a harmonious state of being. Content: A talk about how Ayurveda can improve your life. Learn how to approach your health in an interesting and practical way with diet and natural exercises. Understand other people and how to effectively relate to them. Try a guided meditation to deepen your awareness and access your hidden energy. Description: Our inner fire is our engine of health. We need a balance between our different ‘elements’. Ancient sources, Pythagoras and Hippocrates, the father of medicine, as well as Ayurveda, define health as the harmony of man’s elemental components. Our modern life often creates too much ‘fire’ which disturbs harmony and leads to dis-ease. How can diet, lifestyle and nature help us improve our health? Content: Find out what in your diet, lifestyle, relationships and environment nourishes your mind, body and spirit. Examine the value of intuition, wisdom traditions and science in creating harmony in your life. Try recipes for herbal drinks that can help balance your inner fire. Experience the effect of singing on the whole of you. Description: Cooking with care and love can be a meditative practice. Eating with attention aids digestion. The resonances of time, place and our own nature – individual type, age, health condition – when sharing meals have been important in many cultures including the Mediterranean, Seventh Day Adventists and often for centenarians. Learn how positive rituals can improve our meals, health and being. Content: Find out about positive new ways of approaching cooking, eating and sharing a meal. Learn some easy food recipes and open up all of your senses in an exercise of mindful eating. Description: The main type of fast is to go without food for an extended period. Fasting allows the body to have a good ‘house-cleaning’ and a rest. Fasting as a way to health and long life, can aid recovery from certain illnesses. All the major religious traditions apply it in their spiritual practice. Gandhi used it, making the personal political. Modern medicine having re-discovered fasting, has now given it a stamp of approval. “The dance, of all the arts, is the one that most influences the soul. 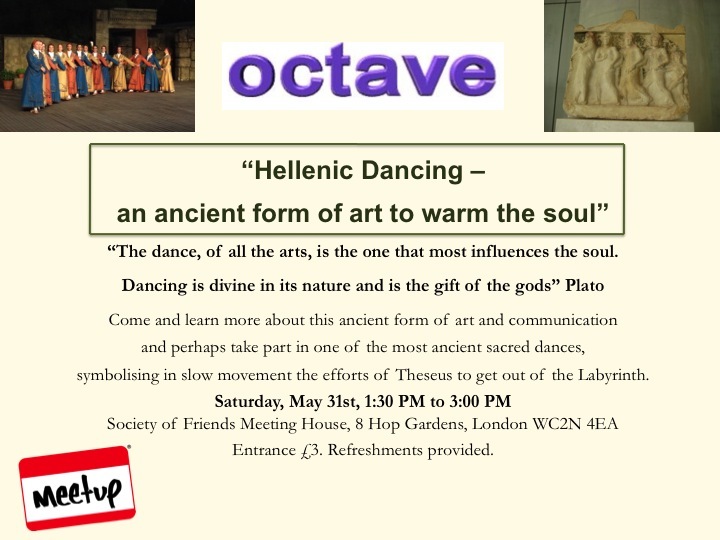 Hellenic folk dancing is a form of art still very much alive in the 21st century. 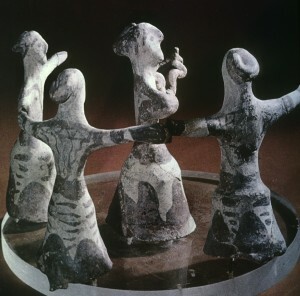 Some of the dances performed today originate in the very distant past, hundreds and thousands of years ago. They often have a story to tell and, together with the music, they touch the heart and soul of people. Dances carry the memories of societies and equally shape society and culture. In this successful event we talked about dancing as an ancient form of art and communication. symbolising in slow movement the efforts of Theseus to get out of the Labyrinth.